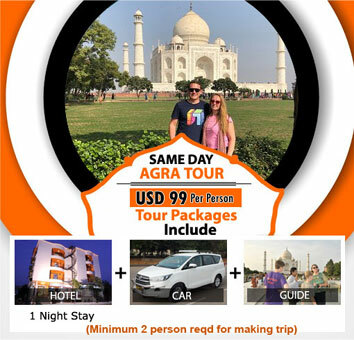 Enjoy the heart captivating and mesmerizing view of Taj Mahal with this Same Day Agra tour package and make yourself mesmerized with the awstrucking beauty of the Symbol of Love that will last in your memories for the lifetime. Meet our representative and get yourself picked from anywhere in Delhi. As our representative gives you a brief about your Day Tour of Agra with Sunset View of Taj Mahal, later you may proceed for your journey. Board your car in the afternoon post you have your lunch and embark on the amazing journey you are about to live. As you reach Agra by the evening, visit the Taj Mahal and enjoy the dazzling Sunset view of Taj Mahal and later visit the Mehtab Bagh which is a Charbagh complex in the north of the Taj Mahal. Later revert to your comfort in private car and drive back to Delhi.